Remember how last week, my father-in-law and I did some rearranging and removing of cabinets in my kitchen? 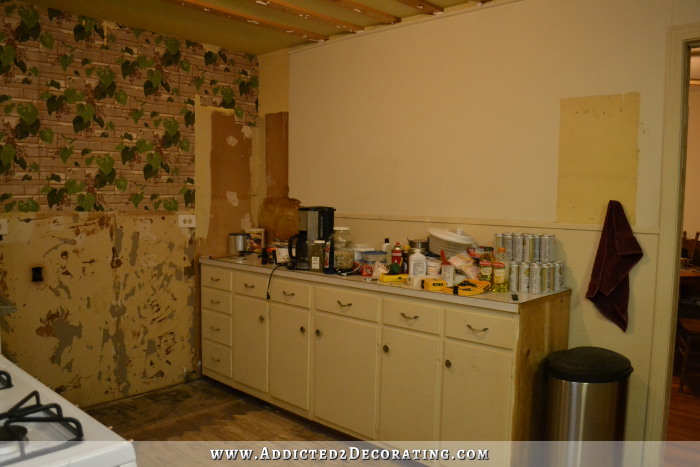 …with the upper cabinets removed completely, and the lower cabinets moved from the wall opposite the sink wall to the wall perpendicular to the sink wall (and opposite the fridge and stove). So I was planning on closing up that second doorway that leads to the den (which will eventually be our breakfast room/dining room), and having the stove and fridge against that wall. Then some brilliant person (people? I can’t remember specifically, but thank you!!!) 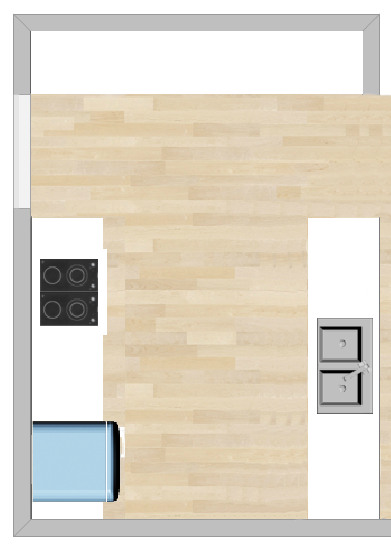 came along and suggested that I flip flop that design, and take out the upper wall between the kitchen and den, leaving more of a bar area between the two rooms. That would allow the sunlight from the huge wall of windows in the den (future breakfast room) to pour into the kitchen, which has no exterior walls, and therefore no windows that allow light in. I absolutely LOVE that plan, and that has been the plan going forward. Only two problems. First, some stuff needs to be moved around (obviously). The water line for the sink needs to be moved, as does the gas line for the stove. So on Monday, I had my plumber come over and give me an estimate for moving the water line and the gas line. I swear to you, I feel like I struck gold the day I found this plumber. And he really is a licensed plumber. I promise, I’m not hiring some shady, non-licensed, non-skilled person just to get stuff done cheaply. When he replaced all of our galvanized water lines a few months back for $1200 (I think that was the amount…or was it $1500? ), and so many of y’all said that it would have been many times that cost in your area, I asked him how it is that he charges so little. He said that it’s because he has no overhead at all. It’s just him and his helper (the one who actually fits under my house). He doesn’t have an office, or a lot of employees. He doesn’t advertise because all of his business is through word-of-mouth. So he can keep his prices low. So he’s coming back next week to get the work done. I’m so stinking excited. I’m like a kid in a candy store. I spend an embarrassing amount of time each day just standing in my (for now) very ugly kitchen just dreaming of the beauty she will become. Now here’s another exciting (to me) part. 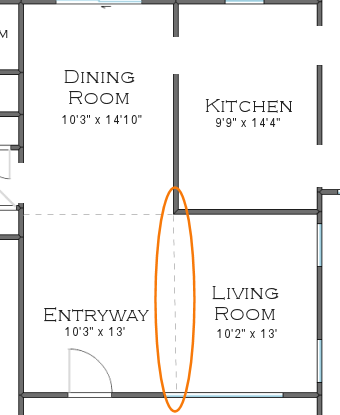 You see how the wall between the kitchen and living room is currently kind of short, and if you draw a draw a straight line from the end of it across to the other side of the living room, it doesn’t even clear the window? So that’ll leave that area on the other side of that wall (because I’m not going to move that kitchen wall — I don’t want or need a bigger kitchen). 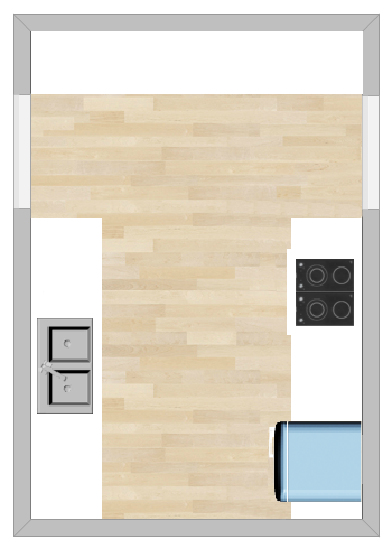 I’ve been thinking that I could put some built-ins there, or a much needed storage closet. But then I had a light bulb moment. So it’s all falling into place, and I couldn’t be happier with it! 1. Several of you suggested a “U” configuration in the kitchen. I promise, it won’t work. The “U” turns my spacious and open kitchen (which really does feel surprisingly big for its size) into a tiny and cramped kitchen that feels like it belongs in an apartment (or our condo). Also, once the “U” is in place, the space for a sink and dishwasher becomes incredibly cramped. 2. A couple of you suggested turning the one wall of cabinets (where the sink is currently) into a full floor-to-ceiling wall of cabinets, and removing the countertop. 3. I won’t be tackling the actual, long-term remodel at this point. I do eventually want to save up for very nice, custom cabinets built specifically for my kitchen, but I have a feeling that’s a ways down the road. So in the interim, I’ll be doing a low-cost makeover in here. I went back and forth on whether or not I wanted to do that (lipstick on a pig? ), and finally landed on a “YES!” The more I think about it, the more excited I get about it. I love the challenge of turning something ugly into something pretty, and I love it even more if I’m challenged to do it on a tight budget. Plus, having a temporary, low-budget kitchen will give me the opportunity to step out of my comfort zone (and I do realize that my comfort zone would be considered daring for lots of people, considering that I had teal cabinets in the condo), and do some really fun, daring things that I might feel more reluctant to try if this were the final kitchen design. So that’s my news, and that’s where I’m headed with this! I have no goals of getting it done by a certain date. I’ll just work on it as I’m inspired, kind of like with everything else. The new plan is awesome! Send your plumber my way please, had to pay for an emergency visit this weekend to fix a leaking (gushing) refrig line. OUCH!!! Have you thought of opening the wall between the kitchen and the living room. If you aren’t putting cabinets there it would help with the flow of the room. Plus you will have a ton of storage in your new kitchen with all those cabinets. I don’t really want those two rooms open to each other. I guess my thinking is that I want the living room to be a place that’s always kept clean and always presentable and comfortable for people who drop by, and I don’t really want that room open to any areas where we will actually do our “living”. That way, if the sink is full of dirty dishes, I won’t feel embarrassed if someone drops by unannounced. 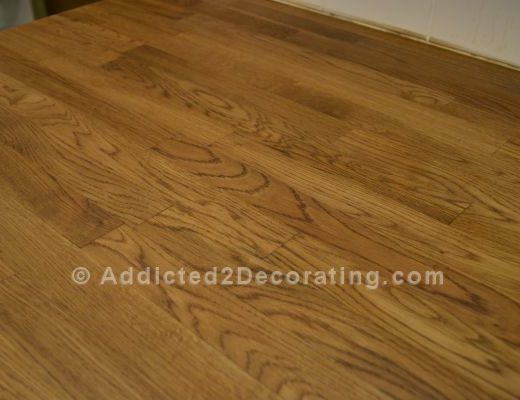 I love all of your ideas and I think you should paint the kitchen floor!! Right now I have all white cabinets and my kitchen and very small dining area are done in blacl and white. I was wondering what do you think of painting my bottom cabinets black and keeping the top ones white? I have wood laminate flooring. Thank you for your thoughts in advance!!! BTW-I LOVE the show Rehab Addict too!!!!! Escpecally since she is from Detroit, Mi where I live in the suburbs of Detroit! I love a kitchen with two cabinet colors — one on top and the other on bottom. I think you should go for it! I love the changes to the floor plan and that green is so bold! I’m excited to see what colors you use and how it flows from room to room. The extra long counter would be perfect for a buffet! Especially with the traffic pattern you will have after you close off that extra doorway. I’m sure it will be amazing as usual! Thanks for sharing your journey! I love your plan. With your refrigerator on the opposite wall, will the doors open the wrong way?…well, there’s nothing ‘wrong’, but more difficult to access? Sometimes the doors can be reversed. I wonder if the wall between the kitchen and den (future dining room) is a load bearing wall…will you need a beam or some type of reinforcement? I love your redo’s and admire all your hard work. Yep, the doors will open the wrong way as they are now, but they’re reversible. That wall is the original exterior wall, so it’s load bearing to an extent. The good news is that it’s on the gable end of the house, so it’s not holding the weight of the ends of the rafters. It definitely won’t be a DIY job, though, I’m having a contractor come out and look at it this week. I love all of your projects! So creative AND inspirational. 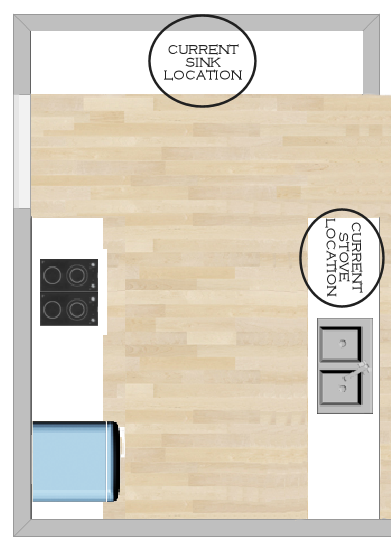 Have you considered making the den the kitchen and having a huge living/dining area? You have so many options. So hard to decide. Regardless, it will be beautiful. I love your new plan and I also like the idea of a long counter for a buffet meal. You can never have to much counter or cupboards! If it was mine, I would open up the wall between the living room and the kitchen. Great flow for you as a family and for entertaining! Have you considered just adding a built in or large armoire near the front door for a closet. I actually have considered adding a closet to the entryway. I certainly think there’s room for it. But I’ll wait until that little wall goes up (the one to square up the living room). I think that wall, while I definitely want it, and it’s not very big, will still make the living room and entryway feel a bit smaller. So if the addition of a closet will make it feel even more cramped, I’ll probably want to find another solution. Woohoo! I’m so happy for you that you’re able to go ahead with a quick kitchen remodel. It’s the only logical solution, right? 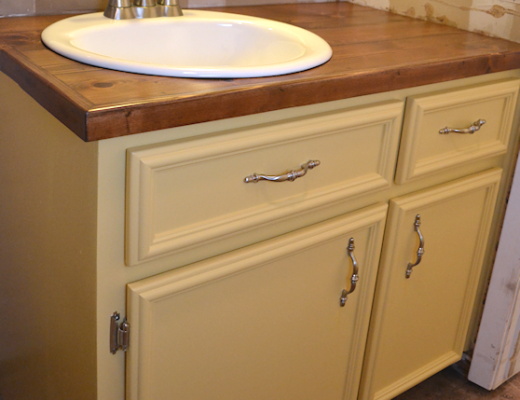 You have to do SOMETHING for now, and re-using your old cabinets sounds like a great idea. Having seen what you can do in the way of cosmetic changes for your condo kitchen, I am very confident that you will be able to a dynamite job. One thing I will mention though. A number of years ago I saw a showhouse where they had done the walls and cabinetry of a bathroom in an emerald green sponged finish. It was GORGEOUS. I immediately went home and painted my main bathroom that color. It was an Epic Fail. The reflection of the color on everyone’s skintone was horrible! It turned everyone green, and I had to go back and redo it. Later I assisted a friend to paint a wall in her foyer the same color, and it too did not work. I don’t know if it was because there was no natural light in the bathroom (though there was in the foyer) or what, but that color just did not work in large doses. I know you had the teal blue on your cabinets in your condo kitchen and that obviously wasn’t a problem, but that green – sheesh! Just a thought for your consideration. A final thought. if you inset the fridge into that wall (which is a terrific idea), will you still be able to leave enough room for the swing of the door and the broom closet you had planned? I’ll still leave that space for the small closet. 🙂 And thank goodness, the doors on my fridge are reversible! Inspired by a magazine, I did the same in a hallway, and repainted the very next day. 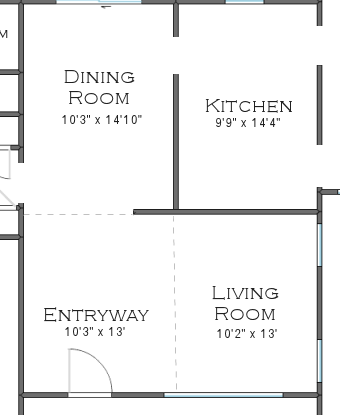 What is the plan for the dining room? Where would you place the closet? We have virtually no entry way, so I’m kind of jealous that you are working with that much space. But that’s the plan for now. Our piano is in storage, so I’m pretty anxious to get it here and in place, and get the table moved to the room that we’ll actually use as a dining room. Nice plan. I just recessed my fridge into my utility room. It only took about 6 inches into the room because you get the 4inches from the wall. Made a big difference. You get that counterdepth look but a larger fridge. Also if you like green look at Benjamin Moore 700 enchanted forest. It’s a great green. 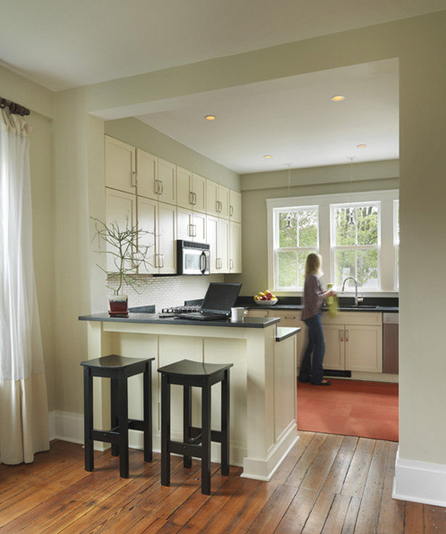 You might want to contact a contractor to verify that you could put a window into your breakfast nook above your sink. Especially since you’re going through the hassle of moving the sink, might as well be in a place that isn’t in front of a load bearing post/wall. That wall is the original exterior wall of the house, so it is load bearing to an extent. The good news is that it’s on the gable end of the house, so it’s not holding the end weight of the rafters. I’ve had a couple of people look at it (not contractors, but people with knowledge about this stuff), and they feel confident that it can be done. But I’m also having a contractor stop by this week to take a look and give me the final word. I’m so excited for you! I think that this is the time to buy that table saw and build your own cabinets… I really do. You’ll save time and energy if you do that now, instead of later. If you’re not comfortable with building the doors, or don’t have all the equipment you’ll need, then order custom doors. Your cabinets will be fine without doors while they’re being made to exact specifications of the finished cabs. One other suggestion would be to find a Habitat for Humanity store and see if they have what you need for cabinets to fill your space and suit your needs. 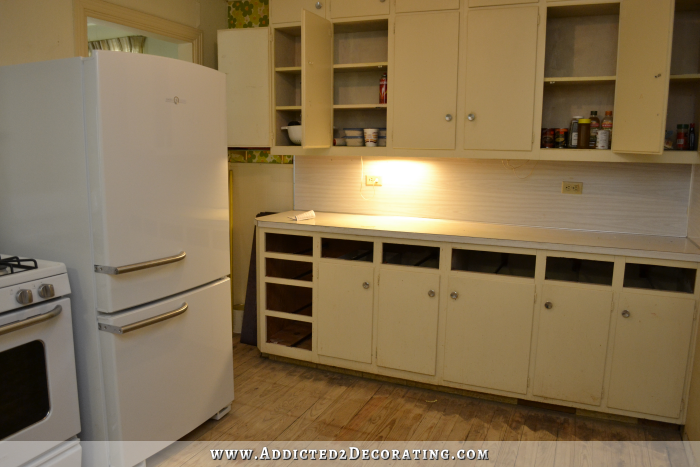 Any lower cabinet can be converted to pull-outs, and you could do that yourself. Check Rockler for the mechanisms you’d need. BTW, I designed my cabinets, with drawers in the lowers, and my hubby built them. Everyone, including ourselves, are always so impressed. Oh, you have no idea how much I want to build my own cabinets!!! I’m definitely considering it, and not necessarily to save money, but because I really want to stretch my DIY skills in this house,and learn as much as I can. And building my own kitchen cabinets would DEFINITELY be stretching and learning new things. Not really sure where I’ll land when the time comes, so we’ll see. I very well might be building them myself. If you decide to go that route, Ana-White and her hubby has built two kitchens recently for their Mom’s duplex (dubbed Momplex) and have shared the plans for the different sizes. I can’t believe you would chicken out because you seem to fearless with all that you have tackled. If anybody can do it, we all know you can! I’ll be anxious to follow your progress. It’s going to be beautiful. I am concerned, though, that the Carmen Diaz kitchen is very dark. Your style is prettier than that. If you don’t like to be in the kitchen, a dark palette might make that worse. The other things I have seen of yours are bright and cheerful. I USED TO HAVE THAT EXACT COLOR ON THE KITCHEN CABINETS IN A FORMER HOME AND I ABSOLUTELY LOVED IT! THIS SI FUNNY, THE CURRENT HOME I AM IN WAS BUILT IN 1917 AND WE HAD TO DO A COMPLETE REDO IN THE KITCHEN. IT HAD THAT SAME WALL PAPER THAT YOU UNCOVERED! THE STONE WALL/IVY MOTIF! I TRIED AND TRIED AND COULD NOT REMOVE. IT WAS APPLIED TO WOODEN WALLS. SO I COVERED IT USING THE PAPER BAG/ ELMER GLUE METHOD AND TURNED THEM INTO FAUX LEATHER AND I ABSOLUTELY LOVE IT. Ooooh love your plans!! I have seen that pic of Cameron Diaz’s apartment and it is gorgeous. It’s dark, but I think all the metallics are what keeps it from being too cave-like. 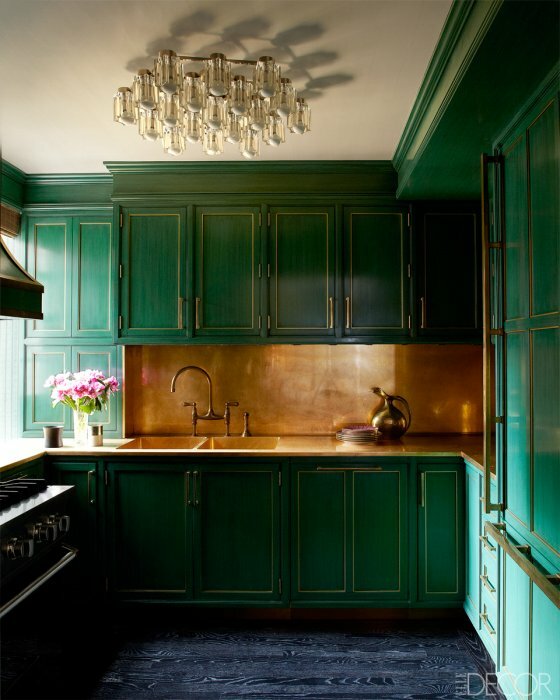 I’m sure you have a fabulous plan, but a metal/metallic or shiny backsplash would be amazing with the emerald green!! I totally agree with you on dark colors – they have a bad rap in today’s bland world of white and light gray, but they can be so rich and beautiful. Yay for a low-budget kitchen you can play with! Lipstick on a pig…I like that! 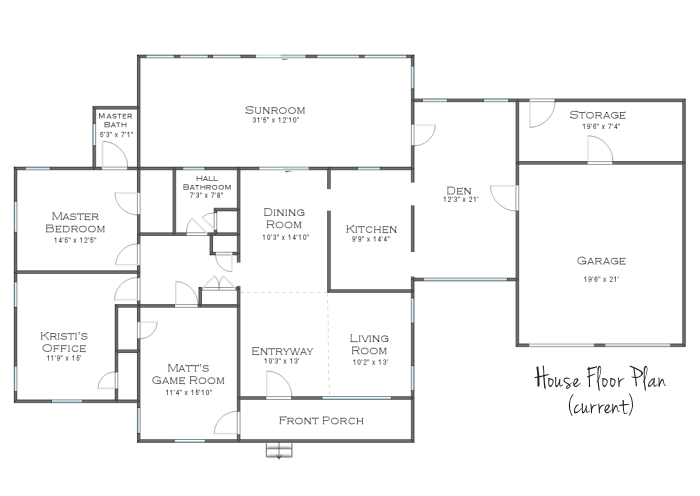 lol…I really like the floor plan and all the ideas. I love painted kitchen cabinets. Mine are a blue/grey and I love them. I too love dark rooms sometimes, but I gotta admit that green? I am unsure of it -but I know you will make it look fabulous if you go that route. I can’t wait to see it! Funny thing is Kristi…green has always been my favorite go to color! (I am shifting towards adding some blues now) so I love green. I think it’s just that particular green. But again, if anyone can do it -you can! I loved the greens and blues in your condo. Can’t wait!!! Maybe paint the lower cabs green and a lighter color on top, or vice versa. That green reminds me so much of the hunter green and maroon that was so overused in the 90’s (sorry). One thing, if you don’t like it, another color of paint is around the corner! But, if YOU like it, do it!!!! Your attitude towards your kitchen (and everything else) made me think of her – both of you take on anything – and do it single-handedly! I so admire that you’re doing a “not the final version” version of your kitchen while you patiently save up for the final version, and that you’re going to have some real fun with it! I think the inspiration photo is beautiful and can’t wait to see how you Kristi-ize it. (Also, I love how the dark mantel on the fireplace and dark shade of blinds plays off the blue walls in the living room.) Carry on! Oh, I love Karen’s blog! And I really like her (although we’ve never met in person…darn it!). 🙂 I love that she’s a strong, independent woman who will tackle large projects on her own. Her chicken coop is one of my all-time favorite projects ever. I haven’t had anyone else mention it, and I don’t seem to be having slow page loads on my blog. Hmmmm…I wonder what’s causing it for you? I just recently moved to a new server, and I think there may be some tweaks I can make to speed things up…but that takes time. For what it’s worth, no problems for me. No problems uploading for me, either. Unfortunately, it’s taking long for me, too. It’s WONDERFUL to see you excited again Kristi and ‘firing on all four cylinders’ again!! Your plans look spot on. Love, love, love your ideas for your kitchen redo. It’s going to be the crown jewel of your home! Have you thought about glass in the doors of some or all of the cabinets above the long counter? Maybe just two in the middle? Possibly a dowel plate rack in the middle with one glass door on each side. Glass could be clear or a light green. And tiny strips of LED lights could light up each shelf with a soft glow. You’ve got plenty of storage space, but something like that would add interest and decoration to a plain wall of cabinet doors. A font forget under cabinet LEDs for that counter. Trust me, you will NOT regret that. Just helping with brainstorming – it’s going to be gorgeous already! Love these ideas! And I definitely love glass-front cabinets. I’d love to add a couple (at least) somewhere in my kitchen! I really like the idea of opening up that wall into the den. I find that once you have that light bulb moment, it brings on the motivation to get things done. We use the “lipstick on a pig” line a lot when referring to updates to our home. That’s exactly what I’m doing in our 65 year old kitchen since we can’t afford a complete reno now (we moved in less than 3 months ago). We also had to have our water lines replaced as they were 15 years past their expiry date. Estimates were between $1500 – $2000 for our 817 sq.ft house but my husbands brother in law is a contractor and did it. It cost less than $1000 for his time plus all the parts (pipes, shut off valves, bits n bobs) and a new toilet. Don’t you just LOVE one man businesses?!!! When we were getting ready to put our house on the market- we desperately needed to freshen it up with a coat of interior paint. We got many quotes. Despite it all-we ended up going with the cheapest guy, seriously a small fraction of the cost of the other guys. We just liked this guy, his vibe was completely different. But mainly because it is just him, sometimes his son and occasionally an apprentice or newly journeyman drywall guy, not a whole slew of mediocre guys. He did an AMAZING job, attention to detail was impeccable. He didn’t try to up sale the job like the other bidders- he knew it was a basic paint job to get the house on the market. He did such a great job- our real estate agent took his info. I think that I blacked out for a minute at the awesome plumbing price. It would almost be cheaper to pay your plumbers airfare and pricing instead of having one from my neighborhood come over. Sigh. Have you looked into unfinished stock cabinets? They may not have as many bells and whistles, but if you are handy you can end up with something really exciting (like that super beautiful inspiration photo!) at a fraction of the cost……I love kitchen remodels. Especially when they are not happening in my own house :). So it’s definitely an option, and would probably be a wiser choice considering the fact that I’m not a cook, I don’t use my kitchen much, and I have no need or desire for a specialized, customized, gourmet kitchen. I used to design kitchens and people seemed to (overall) be happiest with with the stock unfinished cabinets vs. other options (pre-finished, custom, etc.) I guess with your creativity you need to ask if you will be happy with what someone else finishes for you. I love the inspiration photo. Wow! You have a lot of good ideas! Your readers have a lot of good ideas! So fun to see the progression of thought with all this good input! I have one small idea to contribute — I think it would look good and ‘feel’ right if you also added a little piece of wall on the other side of the opening between the (current) Dining Room and Entryway, to match the extended wall you’re planning on the other side. It would make the Entryway/Living Room area feel more room-like, make it look more balanced from the front door, and still leave a nice opening into the future Music Room. Just a thought. Oh, yeah. I think I the floorplan going into the wrong side of the wall. I’m confused. I love that look into the dining room. No clutter, just plain beautiful. Yes! 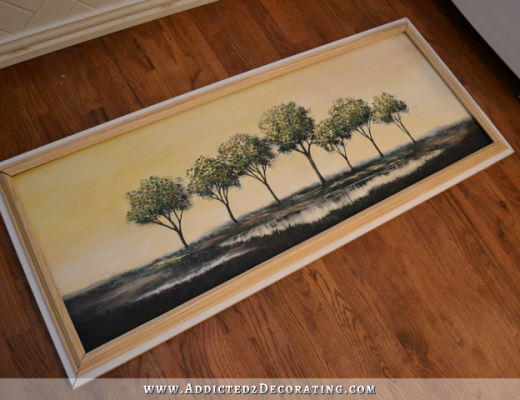 Love the inspiration pic you’re using for between the kitchen and (future) dining room! Okay, as much as that kitchen is beautiful in green, I have my reservations (but then I’m the colorphobe). I know you will pull it off (you always do!) and look forward to seeing it come together! I love it and am always inspired by you. But I thought the couch was your next project? The kitchen stuff kind came along on a whim. Since my father-in-law was here for two weeks, I wanted him to help me with as much of the “heavy lifting” projects as possible, and removing and moving the kitchen cabinets just happened to be one of the things on my list in order to make the kitchen more functional. And now it’s become one of those “one thing leads to another” kind of projects. But I’ll definitely get the sofa done soon! I just need to make a decision on the fabric and get it ordered. I can’t wait to see the reupholstered sofa! And the kitchen! I know what you mean about not having the kitchen visible from the more formal living area. But won’t guests have to walk through the kitchen to get to the new dining room? Would that bother you? Yes, they will, Char. And that’s definitely less than ideal. But hopefully it’ll only be temporary. On the whole house floor plan, you’ll see that there’s a door from the sunroom into the den. The sunroom will eventually be remodeled into our family room, and the den will be the dining room, so that will allow access from what will probably become the most-used room of the house into the dining room, so people won’t have to walk through the kitchen. 1. Glad you found a plumber to move your infrastructure around in the kitchen for a reasonable price! That is wonderful and you will be happy. 2. I like your new floor plan a lot. 3. Opening the wall to your den/future dining room will give your kitchen so much more light and you can use the bar area as a buffet for dinner parties. As you proved in your condo, color is awesome in a kitchen and I would guess the green example you showed us will turn out beautifully. 4. Love that you’re squaring up your living room. You will probably enjoy a bit more room and continuity. 5. I think you’ll like the little bump out for your refrigerator. Please make sure that you leave enough space so you can easily open the door without bumping into the wall. You’re so cute Kristi! Good Luck to you on this – especially the Thanksgiving Feast! DD hosted her FIRST Thanksgiving dinner about two weeks after she was married and invited her in-laws, and our family – eight people total! I had to give her kudos for even attempting, (she really doesn’t have much experience cooking period, even now 1 and !/2 years later ) but of course I was there every step of the way guiding her, but she did a good job, and I’m sure you will also! Am I understanding you correcting that you’re thinking of doing the Cameron Diaz look in your interim kitchen, or your final kitchen? And yes, you ARE daring. But who know? I may love it so much that I want to replicate it in my final remodel! I just came from Home Depot and looked at. 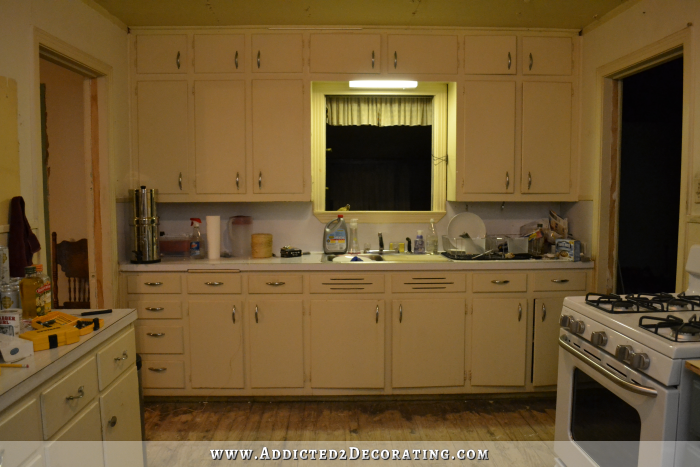 Rustoleum Cabinet Transformations. I comes in 32 great colours from frost white to country blue to black and everything in between. The whole thing is a kit for under $100 that includes a cleaner/due glosser so no stripping, the colour , an optional umber glaze and the too coat. Enough to do 100 square feet. That may be a perfect way to put lipstick on the pig until you can make your own cabinets. Their website has tons of actual before and after pictures from customers. Also thought that to prime you to make your own cabinets will there be room for an island you could build, put on big casters and move it to where it is needed and out of the way when not needed. Building one cabinet first would let you see if you want to do the major project. How about incorporating a pull out counter top/chopping block that would be Matt’s height? One more comment. I love the recessed fridge but remember that fridges need good air circulation so they operate efficiently so leave enough space around it. I’m the lady who was the kitchen designer who suggested knocking down the wall. I’m happy you are so excited about the new layout. 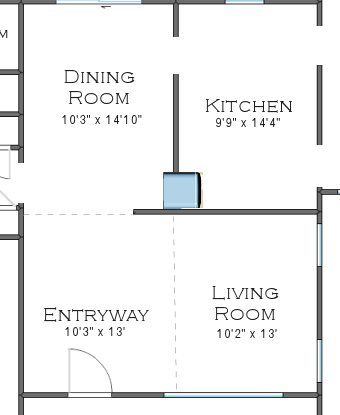 However, please take your floorplan and measurements to a kitchen designer BEFORE you bring in the plumber. There is NO DESIGN FEE at most of these places. It takes years of experience to know the proper way to layout a kitchen and avoid potential problems. Few people realize that there are actual rules the NKBA has set in place to ensure a kitchen that functions well. Your basic work triangle looks great but please have your final layout tweaked before bringing in any tradespeople. One final thought, most of these designers are commissioned salespeople & I know you are not buying cabinets at this time but they would certainly appreciate you buying all the other pieces that go ino a kitchen remodel from them. I’m excited to follow along with you on this project! Oh my goodness. You had me a “recess the fridge”. WHAT a brilliant idea! I’m hoping your having lots of lighting with the dark cabinets or you’ll never want to cook bc dark is depressing! Love the color though. Also would the cost of pushing the fridge back and building cabinet in the dining area be worth it? It’s in a corner so sitting out a few inches won’t really be in your way. Just a thought. If you can’t open your fridge door toward the kitchen,or change it, you may want to put a small cabinet beside the door handle side. Ideas from an older fan! Been there….made mistakes,done that! I love it!!! I had to redo my kitchen on an extremely low budget 2 years ago. You’ll have to check out my kitchen Reno album on my fb page. I too am addicted like you 🙂 My countertops which HAD to be granite left me with less than $2000 to complete the rest, but I pulled it off and love it!!! Hard diy work pays off and I never mind patting myself on the back for a job well done!!! Keep the ideas flowing, and coming! Love your newest kitchen design! Especially the recessed fridge. I’d give anything to do that, but it’s not possible in my kitchen. Have you thought about moving the refrigerator to the right side of the stove? I know that it’s nice to put the largest appliance in a corner, and you probably couldn’t recess it, but people going in and out of it wouldn’t have to go into the work triangle. And you wouldn’t have to change the doors. Just a thought…. Kristi, love your blog. I especially like the way you ask your “followers” for their opinions and ideas and even incorporate some of them into your plans. To me that is so smart since everyone sees things differently and it is extremely hard to think of everything. We were able to recess our refrigerator by just doing a bump out in the garage. It made all the difference in our kitchen and the extra space allowed for a huge island. I think your plan for a large wall of cabinets is ideal. I’m sure you have thought of it, but you could add some glass doors to the top part of the cabinets to break it up a bit and display some pretty pieces. Also, on one end of the run of cabinets or maybe even both ends you could add a stack of cabinets sitting on the countertop and going up to the ceiling from there. Then, by building some armoire type doors on the bottom portion of the upper stack, you could “hide” some small appliances. My DH built these for me and they work out fabulous. He actually built bi-fold doors that look just like my cabinet doors. They open nice and wide so I can use the small appliances right were they are since he added electrical outlets also. These doors hide our microwave and espresso coffee maker behind one set of doors and our Kitchenaid mixer, food processor and food saver behind another set. This way everything is convenient, but out of sight. (Hope I explained this well enough so you can picture it.”) Can’t wait to see what you do next. You are very inspiring! Love this new plan. I had an open kitchen with a high counter in my last house. Dozens of times I wished the entire counter was the same height. I didn’t like the higher counter. I felt it cut my work space in half. However, a lot of work space for you in that area may not be an issue. Just a thought. All those ideas to flip flop your design and open up the wall were pure genius. I am so excited for this plan for you!! Thanks, Jenny! I clicked over after reading your last comment, and their stuff looks really nice! I haven’t really taken time to look at all of the options, yet, but I’m definitely excited to look into it more. Obviously, kitchen is the heart of your home, so design style is much important for planning a kitchen. I am much impressed by your information and I will keep in mind all the things, which you have shared for designing the kitchen.